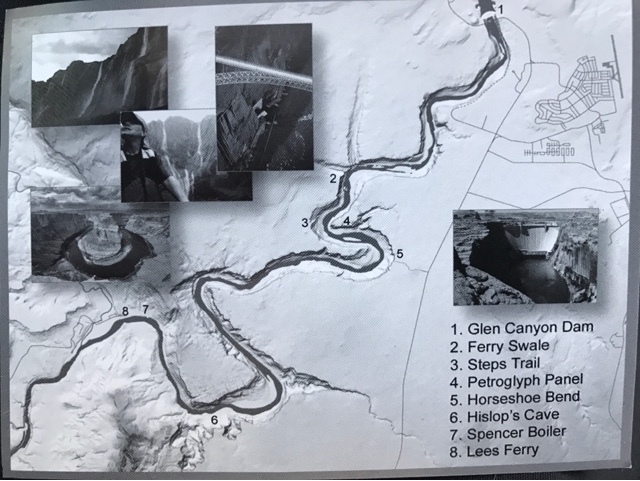 In my past trips to Page, AZ I skipped the flat water rafting trip down the Colorado River below the Glen Canyon Dam. 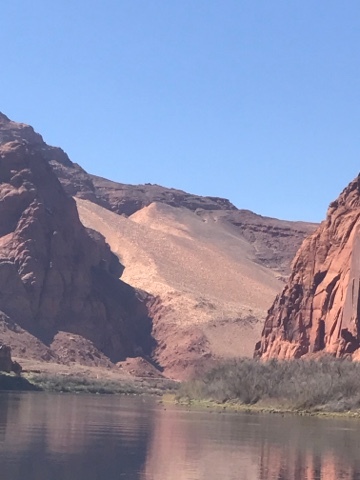 This year I decided to take the rafting day trip and here it is. 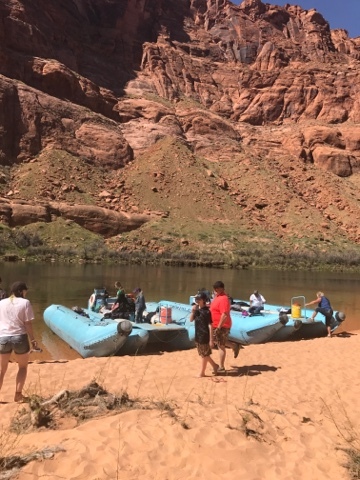 At $113 per person for the full day trip down the Colorado River I feel it was a bit pricy, but when all said and done it was interesting and a decent value. 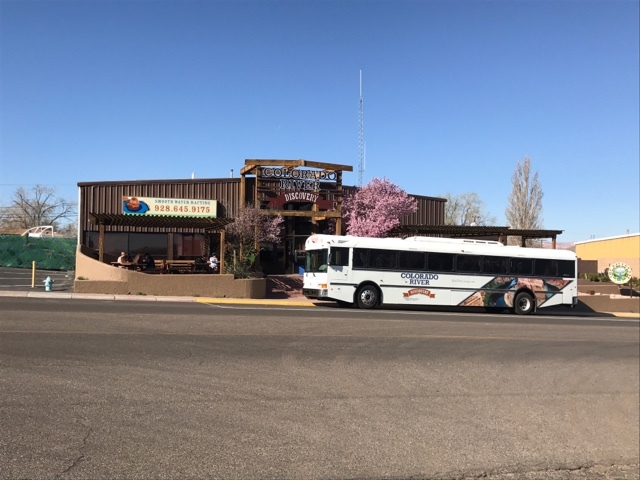 We meet in the center of Page, AZ for 8:30 check-in for the 9:00 start of our day trip. There is our bus in front of the booking office. You can bring a backpack and it will not get wet unless it rains. There is no white water on this rafting trip. 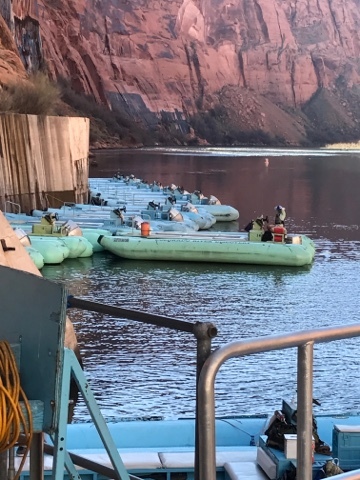 No pocket knives or other such items are allowed as the Department of Homeland Security runs the dam where you embark on your rafting trip. 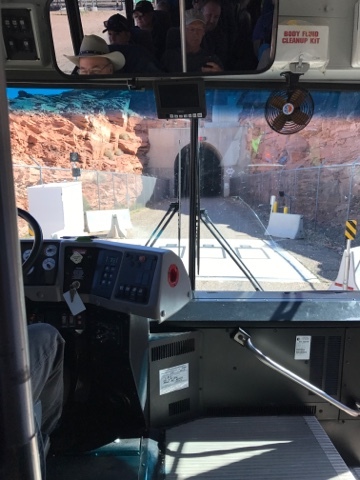 The trip takes you down a tunnel road built for the dam construction and through security to the rafts. 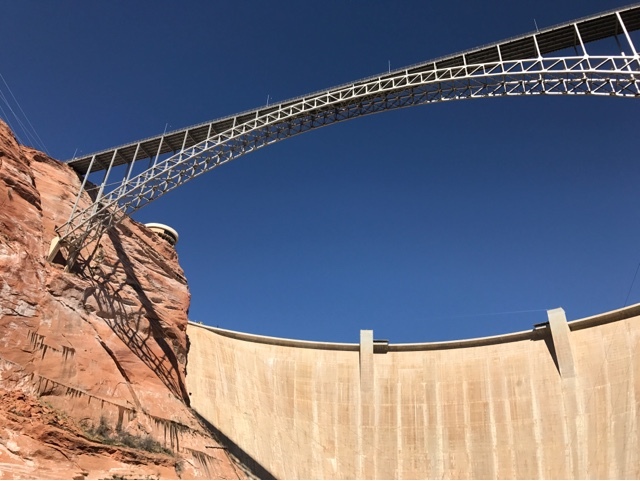 You need to wear hard hats for a short distance as you are directly under the bridge that people walk over. Don't want a coin landing on your head from that height. They move you along to the rafts where you take of the helmet. Our rafts await us at the bottom. 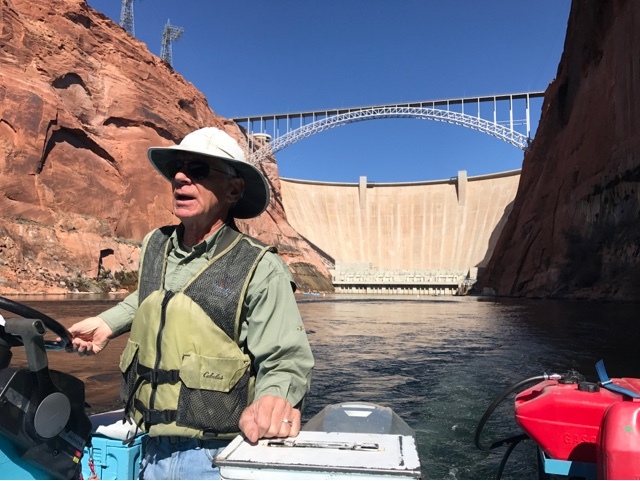 Jerry is our river guide and with 15 years experience he is very good at what he does. He conveys lots of personal information about the canyon. 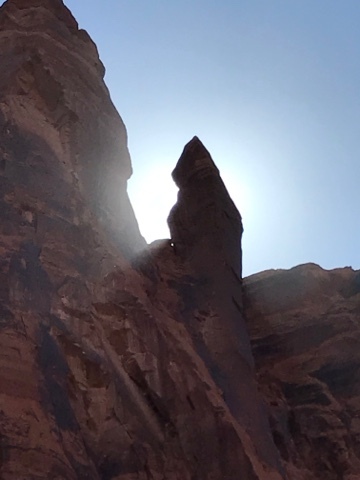 Jerry stops the raft for the light of the sun to be directly behind this rock formation that looks like a monk with a hooded robe. The scenery at the start looks like the next turn but the birds that nest in the cliffs are fun to watch. We stop for our boxed lunch included with the total price on this sandbar in the clif side. 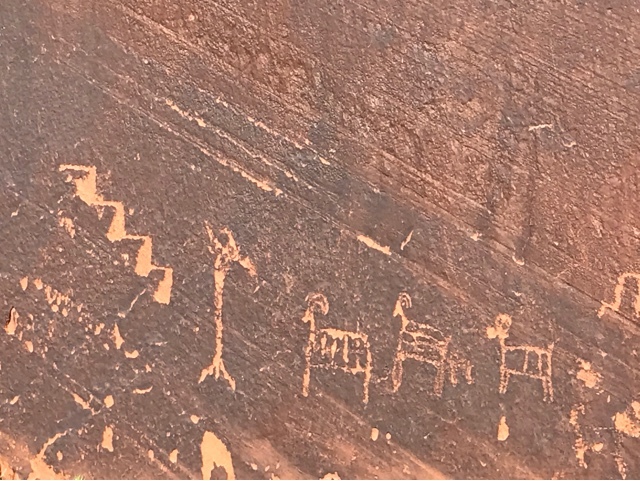 There are petroglyphs at this stop that breaks up the trip. 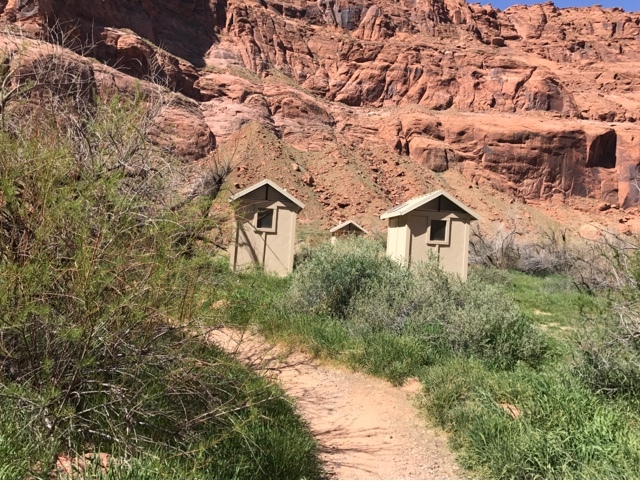 There are composting toilets for those that needed a rest stop. 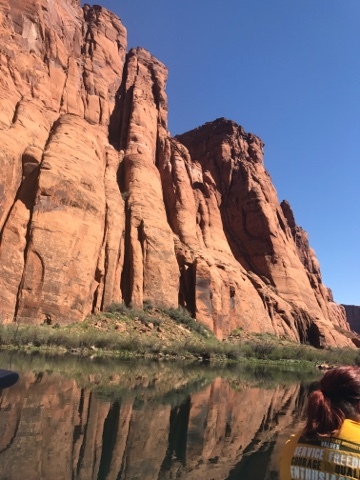 The water is generally flat and you can the canyon wall reflection. 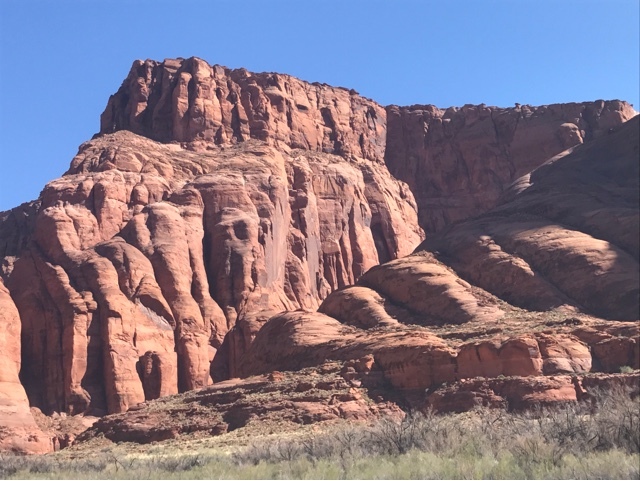 Further downstream there is this very large sand dune that was formed by sand blowing over the canyon wall. This is one of the last hills before the river Wall's go away for a distance where a ferry used to bring people back and forth before there was a bridge. This is Lee's Landing Ferry. The ferry is long gone but this is where we end our day trip. 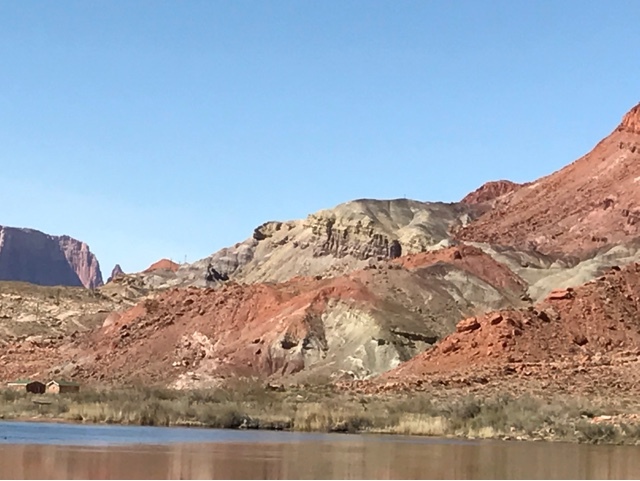 This is also the spot where the white water Grand Canyon rafting trips start. 270 miles down is where you finally can get out after leaving here. I too this picture to show the various colors in the stone near the landing. 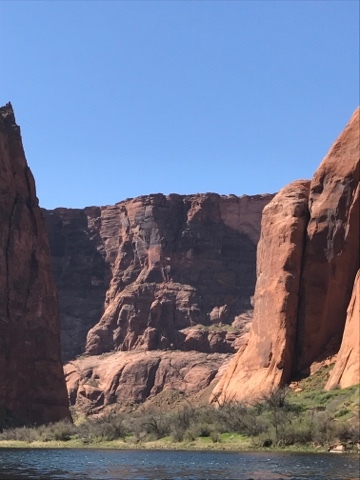 This area is part of the gulch that I hiked the other day, although about 20 miles up into the canyons. We were supposed to return for 4:00 but we needed up arriving back at 4:30.